Occurrence-date: March 06.,1978. Time: 03:00 a.m. The witness, Mister Arne B. Nielsen from Herlev in Denmark and his girlfriend were chased by a object, when they were on there way home to Herlev from Kalundborg. "One evening I had been to Kalundborg, my girlfriend and I home went home about 03.00 a.m. 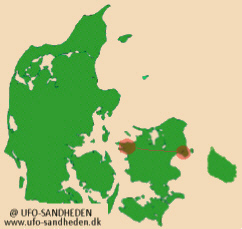 When we had driven approximately five kilometers from Kalundborg, my friend said: "There are two lights in the field over there", while she was looking to the left". "I thought that was strange, I did not recall ever seeing a house there before. Approximately ten minutes later, we found it strange, that the two lights (one sharp and one weak, but not blinding) was at the same distance from us, approximately 500 meter. However we thought it to be a helicopter, as it stood nearly at the same spot in the sky". "The light flew in ahead us. When the road was turning, they glided in, so that they had the place in front of us, and the distance between the two lights were the same". "We reckon that, that they were chasing us, but we wasn´t 100 percentage secure, until we got off the freeway near Glostrup. The turn here is at 90 degrees. When we had made the turn, the lights were to the right side of us, however slipped in front of us again in a distance of approximately 300 meters". "When we passed Herlev Hospital and turned left, they flew around the back of the hospital, but found us again and stood approximately 200 meters from the back my car. At home we got out of the car, and they were standing 100 meters above my neighbour. We looked at them for five minutes, however the only thing we could see, was the two lights and between them some fog on a otherwise clear night. There was no sound coming from them, and they stood still". "Half an hour, after we had gone to bed, I got up to see if they were still there, and they were, however the next morning were gone".